A while back, I temporarily needed to upgrade my free LinkedIn account to a Premium account. 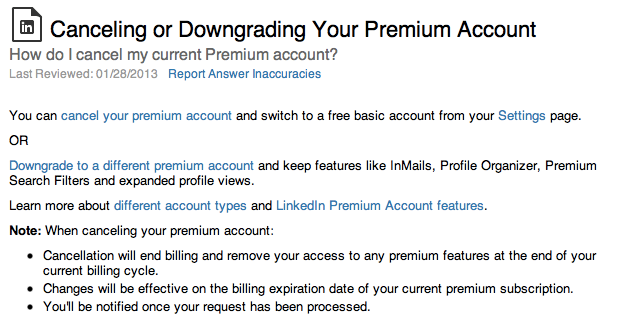 Today, no longer needing the premium services, I visited LinkedIn intending to downgrade back to the free plan. What a nightmare. I first visited the “Accounts” page. According to this page, I should be able to downgrade in the “Privacy & Settings” section. Let’s go there. We’ve now arrived at the link-overloaded “Settings” area. Long story short (too late, I know), we don’t find downgrading under that big “Account” tab—that’d also make too much sense. Instead, it’s that obscure little “Downgrade or cancel subscription” link at the top. Ok, so let’s go there. And let’s all let out a collective W.T.F?!? So from the area where I’m supposed to be able to downgrade to the free version, I find options to downgrade to a paid “Personal” account—i.e. an account option not even shown on that earlier paid-accounts screen! WHERE IS THE BASIC/FREE PLAN!?! 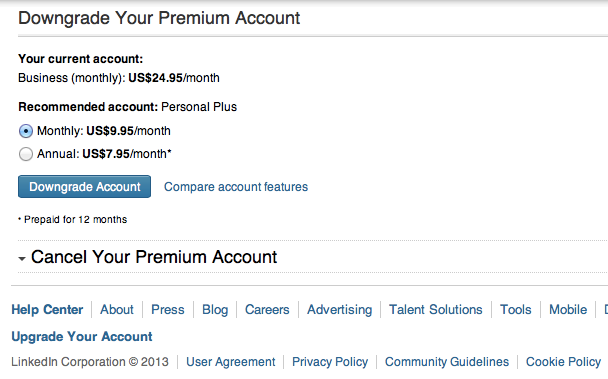 OK, hold on—there is that “Cancel your premium account” text that somehow looks out of place. It kinda like the header to an empty disclosed area, since the disclosure arrow is pointing down. Uh oh—”Cancel” my account? I’m not sure I want to click that. Is that “deleting” or “downgrading”? Who knows! Where’s the option to just get back to the free version? Lo-and-behold, my account is still there, now free, and with an “Upgrade” banner, urging me to upgrade to the Premium account—something I will never, ever do again. So there you have it, to “Downgrade” your premium account to the free plan, the procedure (if you’re successful in even figuring it out!) is to click the “Cancel your premium account” link. To upgrade, you press links labeled, “upgrade”, but to “downgrade” you click a linked labeled “cancel account”. Thanks. Its indeed very bad and I felt cheated as they offered a free account and then started charging. I know, same here, this is a total lack of respect !! unscrupulous, dishonest. Dorry I’m so angry ..and there is no way to call someone at a customer center. Its common practice that websites use to get peoples money. Its called dark patterns. They make it really easy to get money for reoccurring purchases and make it very hard to cancel. In some cases you have to send a personal letter by mail to cancel an account. It may be easier to deal with the bank. Many thks for this info, I was considering to upgrade but this ended that for good. Thank you for this, its a nightmare! As I have been charged for a service I thought I had cancelled! That’s disgusting behaviour from LinkedIn. Thanks for the account deletion tutorial. So a big shout out to Robert, and a big boooooo to linkedin webpage design. I was looking to downgrade last year but missed the deadline because it was so difficult to do so, and it slipped and auto-renewed. I am trying to do it earlier now, thanks for posting this really helps. It is not a matter of poor design, but deliberately designed to make it difficult to downgrade. Borderline fraud. I have been very disappointed with LinkedIn, and its a bad on myself for getting enmeshed and believing all that hype, and letting myself be caught up in it. In retrospect, wasted a lot of precious time–would have been more productive watching no brainer TV and cheaper too. I have just had the same experience, ran over into the second month of membership and I have been charged. Did you get in touch with LinkedIn to try for a refund or have they got a strict stance in this? I find this utterly ridiculous! No I did not, but this year, I downgraded it to Free account immediately when they reminded me of my anniversary, and wanted me to upgrade. I did it–so what if it was one month before renewal. What they did was deliberate; legal but unscrupulous, and reflective of low ethics and morality–says a lot. Thank you for this post. I was lured into a premium account by accepting the one month free trial. I cancelled it before my one month was up only to find out that it had downgraded me to the job seeker account which was still $29.99. I tried clicking the ‘contact us’ link to discuss the issue and have them put me back to a basic account only to find out they disabled that link. This made it almost impossible to resolve the issue until a chat box suggestion popped up. As soon as I told the rep my issue, he immediately put me back to the basic account and refunded the money they took out of my account. I will never do a free trial or attempt to upgrade ever again! Linkedin is clearly sleazy. 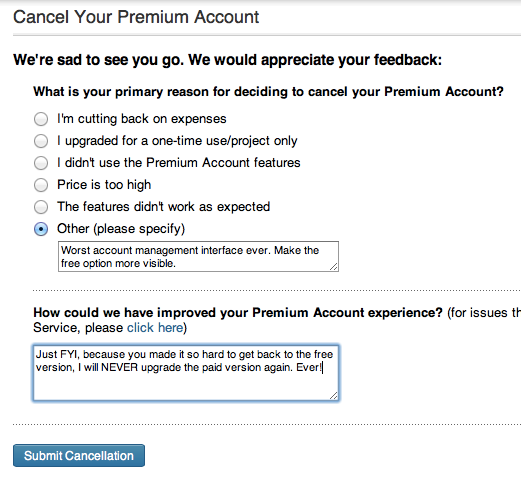 They are so money hungry they rely upon cancellation prevention rather than actually adding value to the Premium level. Is it cancelled for me yet? 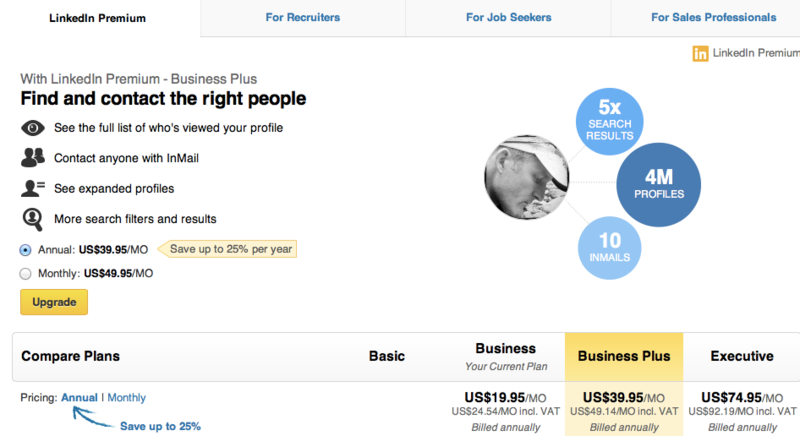 @arpakornjitpongstaporn:disqus You do realize I myself am NOT LinkedIn. I am just somebody who wrote a blog article about LinkedIn. I personally have no idea about the status of your personal account at LinkedIn. It’s really the worst website ever, with even a worse user interface. It’s going to take me a really long time to cancel my account because of the number of steps involved. 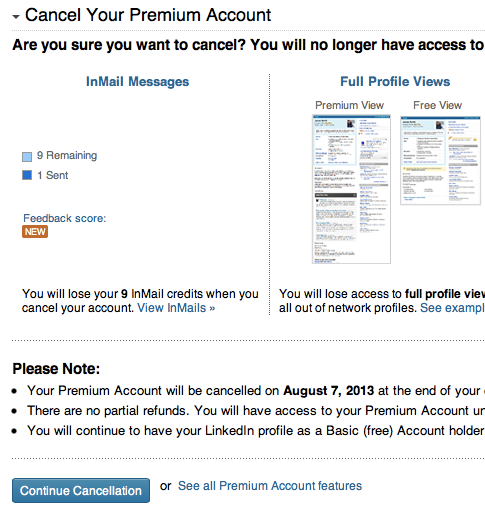 For instance, at the present time I have a premium account that I’ve canceled, but it won’t take me back to having a basic account, and because of that, I’m unable to cancel my LinkedIn account altogether. I cannot wait to not have a LinkedIn account at all. Five years on and the issue has remained the same; if not worse. I am so fed up with LinkedIN. I upgraded to free trial account and cancelled auto-renewals through iTunes almost immediately so that I am not charged month over. At the end of the premium, when I want to close my account for good, I am told to contact Apple!!!!!!! Apple says “well, there is no subscription for us to cancel, go back to LinkedIN” – duh! I am this close to suing LinkedIN for holding my data against my will. I fell for this scam also. 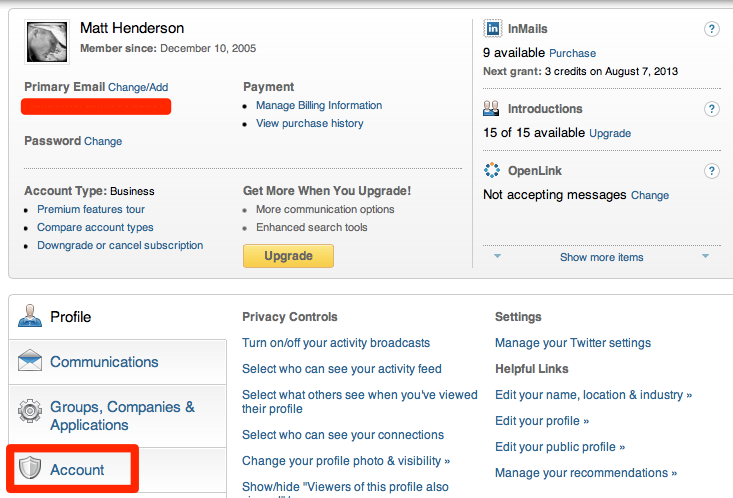 Consider that LinkedIn DOESN’T message when they debit from your account to pay for Premium. They could but they don’t. So no notification. Second they have receipt URL where you can view your payments… but finding it is hard – it certainly isn’t in your profile setting page. Or your not notified that your paying by virtue of a simple graphic indicating that. They send you an email that may or may not get to you depending on spam or other things. They own platform but they deliberately seem to conceal that you are paying. Previous Previous post: Google Authenticator broken in iOS7. Use Authy instead.